Here is a list of beers we have kicked in 2017!! "Me and my German roots LOVE this place. Cozy, good service, and great German fare. The bar area is always jumping, the dining room is always full and the new outdoor patio looks like a fabulous place to sit and drink the afternoon away." 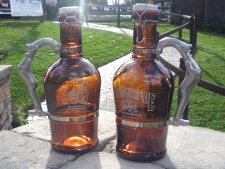 Newportville Inn Beer Growlers Are Here! You can now purchase one of our Beer Growlers for only $22.97 in our Restaurant/Bar or in the Take Out Store. These 2-liter Beer Growlers will make the perfect gift for you or a friend. Visit the bar and get them filled for home. Our Growler prices vary from $8.00 to $16.00 depending on the beer. We also fill Beer Growlers from other bars, so come on in and fill 'em up. *Due to the cost of certain beers, prices are subject to change.